Smith & Wesson Biker Black Ops Folding Knife with Tin | BUDK.com - Knives & Swords At The Lowest Prices! 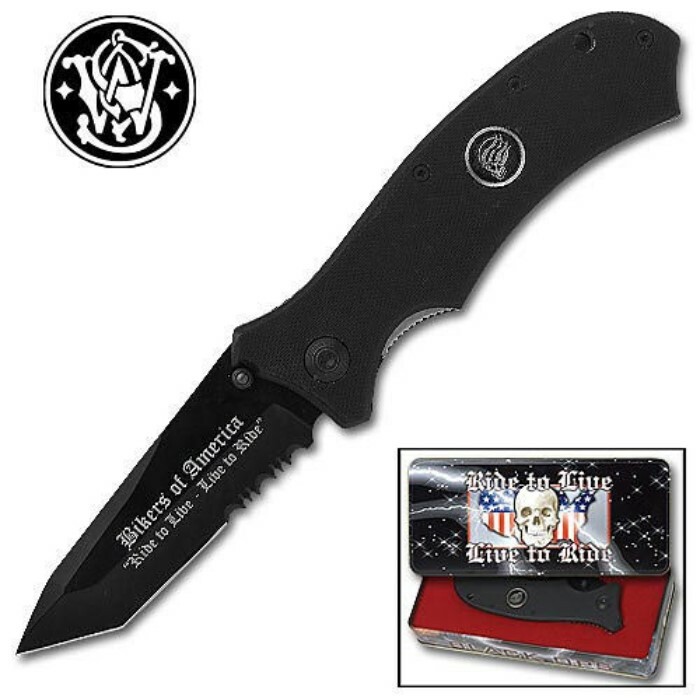 Celebrate the independent spirit and raw attitude of the American biker with this special collector's edition Smith and Wesson knife. The knife measures 8" overall when open and features a 3 1/2" titanium coated, black 440 stainless steel tanto blade. The blade offers dual thumb studs and white printing that reads "Bikers of America" and "Ride to Live - Live to Ride." The G10 black handle sports an embossed skull shield and pocket clip. This item comes in a special presentation tin with the biker's creed engraved on the bottom. Taylor Brands, BIKET.